How this works is that there are people who would put up jobs on Microworkers, and other people such as yourself getting paid from completing these jobs. To put this simply, I’ll call them job posters and job seekers for easier referencing in this article. Once the job seekers actually finished a task, the job posters will credit money to the job seekers account. You can be expected to be paid a few cent up to a few dollars per task depending on how much a job poster would pay. Best of all, sign up for the site is free! Once you are in, you can pick the jobs and task and you get paid after that. If you are a job poster, you can definitely use this platform in order to reach people to do your jobs, but I would not be covering that section in this review. After which, you would need to verify your Email before you are able to log in. It is also important that your name is correct as you would be sent a PIN number to your address (which you will fill in later). Once you have logged in, you would be presented with a list of tasks that you can do. This can range from signing up for various things, clicking on stuff, commenting on a video, and even more. Success rate: This means how many people are successfully completing the task according to the job poster’s requirements. You are required to maintain at least 75% success rating in order to keep using microworkers. If your success rating drops below 75%, you would have to wait up to 30 days before you can complete another job. Basically, do the jobs you can complete to ensure this stays high. If you get mis-rated by the job poster, you can always lodge a claim to microworkers and they would look into it. TTR (Time to rate): This indicates how long the poster will take to verify that you done the job. Done: Indicates how many tasks are done already. 32/48 means the task has been done 32 times, and need 16 more inputs before the job is completed. With many offers and tasks that you can do, you should be aiming for the ones that you can complete quickly and without much hassle. Generally, I tend to avoid anything that asks you to sign up as it is a very tedious process. I rather do the jobs that require you to click various links or do a search on Google. You can sort according to the most paying job, latest jobs, best rating (success), or TTR. Use this to your advantage to find out the best combination of tasks you can complete. There is also no difference in Jobs or HG jobs. The only difference with HG jobs is that the job posters hired you directly for the job instead of opening it up to everyone. Once you decided to take on the task, you would encounter a page similar to this to show you what you need to do, and what you need to submit. The details shown will tell you how much you earn and the time needed roughly you need to spend on it. Tasks will be reviewed in the given number of days too. The instructions are usually clear cut to answer, and I recommend avoiding any tasks that are not clear in what they want you to submit (In order not to jeopardize your success rate). If you choose to take on the job, you can click the submit button below the instructions and fill in the details that is required. This part is slightly tricky especially if you are withdrawing for the first time. You would need to receive a PIN from them which is only sent to your mailing address. This is done to prevent fraud and users having multiple accounts on their part. Without verifying the PIN number, you would be unable to withdraw any money from Microworkers at all. 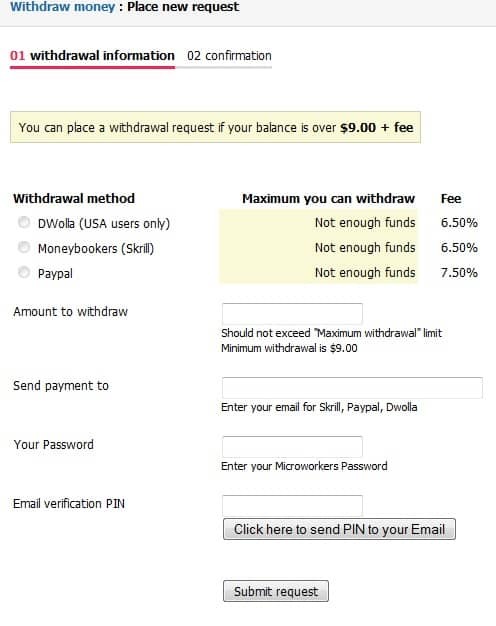 Once you are done with the PIN process, you can withdraw your funds from the ‘Withdraw’ tab. The page is quite clear on what you need to input in order to get payments. There is also another Email verification PIN so that you are able to cash out as well. They definitely are very strict about it, which I think is done to prevent people hacking accounts and cashing out to their own Paypal. Minimum would be $9.675 in order to cash out to Paypal, which I believe should be rounded up to $9.70 for easier counting purposes. Don’t bother with the tasks that take too long unless it pays very well. Try to do tasks that you are particularly good at, as you may be able to perform it at a faster speed after awhile and maximize your earnings. Avoid tasks with low success rates. There may be a reason why it is so low. Remember to finish the tasks that you sign up for, and also make sure you done the job properly or your success rate will drop. Microworkers does not have a referral program as of typing of this post. I will update this accordingly if it updates with one! I have not really used Microworkers much to get a payment proof of my own, but I know it is rather legit seeing these screenshots here. A topic opened on the sub reddit of Beer money have also users proving that it is definitely legit and paying as well. Microworkers has also been around since 2009, so they are pretty credible as it has been around for 6 years since they launched this service as well. Different ways you could earn money from! The earnings are somewhat little for most tasks. At best, you may be able to make about $2 – $3 on an average per hour. Tasks are dependent on your success rate, and it could be easily pulled down if you are unable to finish a task. Waiting for your physical PIN would take quite a while for it to come. 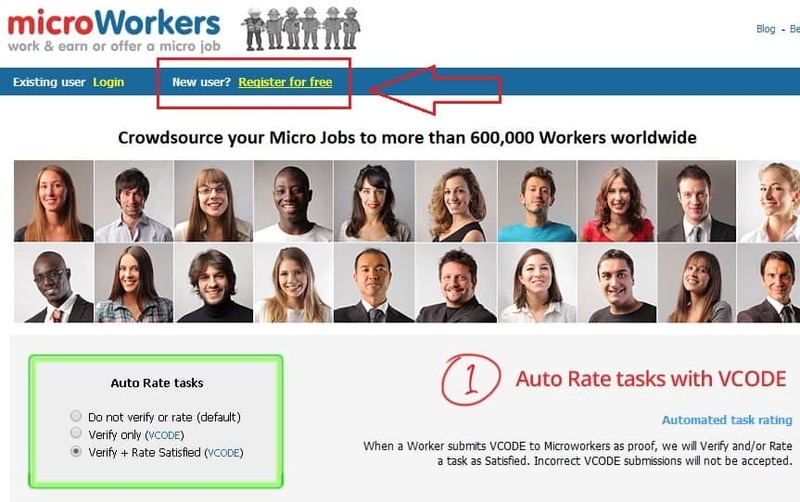 Microworkers is definitely a place where you can earn some extra pocket money if you like doing small tasks for people online. Granted you don’t get paid a lot per task, but getting extra money online is still great! This website definitely accept users from all countries as well, which is a plus point. But I believe the pain would come when you are waiting for the PIN number (expect to wait up to 1 month) to arrive so that you are able to cash out. Once you pass this part, it should be much easier though. Personally, I have not used Microworkers much, but I wrote this review as I know that this website is a legitimate place for people to make money online. Many people have also said good and positive things about it as well for me to trust the legitimacy of Microworkers. As always, check out my full list of apps and websites here! There are definitely other websites and apps you can use to maximize your earnings online! Let me know what you think about Microworkers in the comments. I love to hear them and reply to each one personally! Want to learn how to make a full time income online? Check out my number 1 recommended product that helped me generate a decent income online even without a full time job! Stop struggling with your money making schemes and click below to find out more! 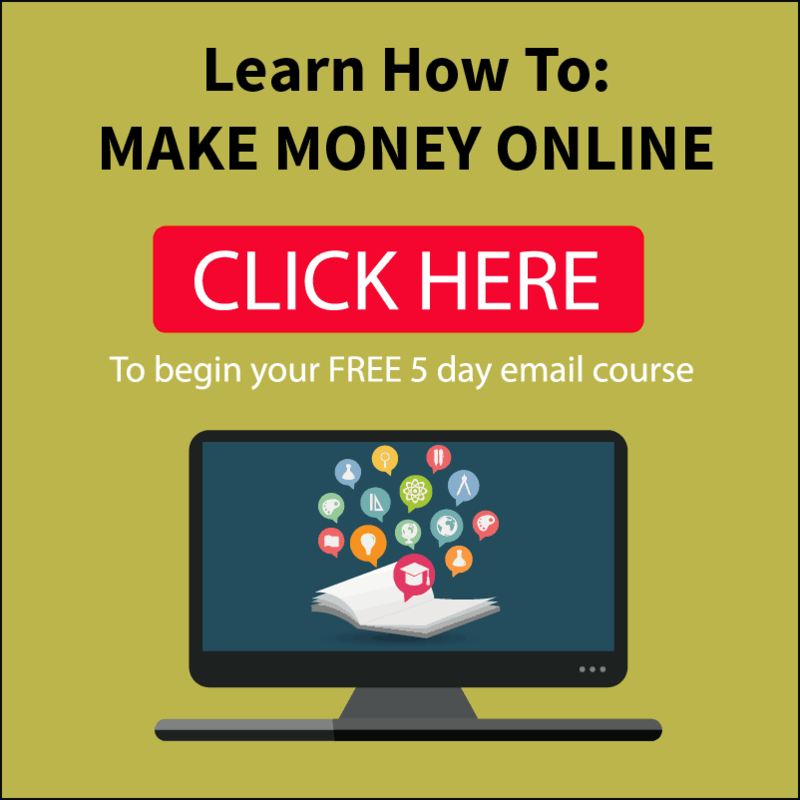 Love your website about making money from home! I agree with you when you mention Wealth Affiliate as being the best way to earn money! I am a member too ! It’s a shame you are not in the UK – otherwise you could have done the programme on my blog! It is genuine, legal and legitimate money maker from home – it’s like getting free money for very little work! I should now because I have been doing this for a while and I love it ! Hopefully, I will see you inside WA ! Always great to see another WA user! Definitely do agree WA is the best way to learn how to make money online too. Thanks for visiting! 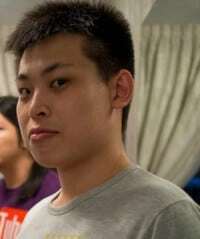 I have been a member of Microworkers for around 18 months. Even though I have often questioned how legitimate what they actuall do is, I have never had any issues with payment… until I accidentally keyed in the wrong Paypal e mail address when requesting a payment of just short of $100 in February of this year. I filed a support ticket and was sent a very curt reply saying that unless I told Paypal to refund the money to them there was nothing they could do to help me. I contacted Paypal by phone who told me there was nothing I personally could do, but they gave me clear instructions to pass on to Microworkers so that they could cancel the payment made to the wrong e mail address and pay it to me. Before getting back in touch with Microworkers I sent a test e mail to the incorrect address I had keyed in only to find it does not exist, so feeling relieved that at least nobody else had benefitted from my hard earned cash I then wrote back to Microworkers apologising for the problems I had caused and explaining what Paypal told me. This time I did not get a reply. I have since written a further four e mails on the subject politely asking them to pay me the $100 they owe me and posted a comment on their Facebook page. I have not recieved a reply to anything. This leads me to believe that Microworkers are a bunch of opportunists who will seize any chance they can to claim money that is not rightfully theirs. I have done some research online and from what I have read this is just one of a number of ways Microworkers falsely extract money from not only their workers but their employers too. I am now in the process of lodging a formal complaint with Paypal about them. 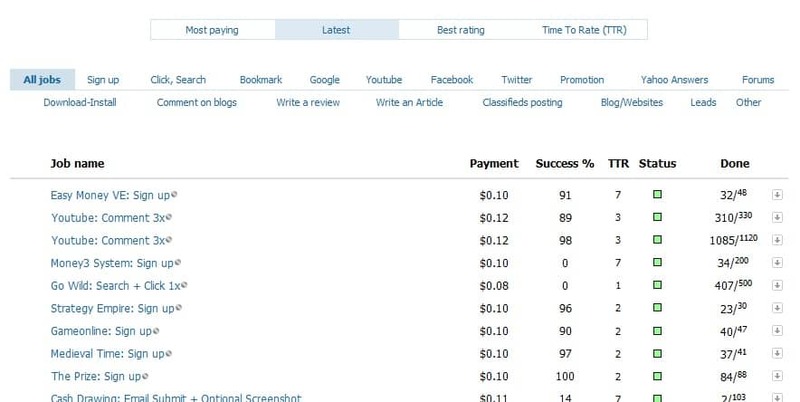 My advice to anyone reading this is to ask yourself one question: do you really believe that any site who takes money off people for paying others to write fake reviews and click on Google Adsense ads, thus robbing and deceiving people could be anything but dishonest themselves? I wish I had looked a bit deeper before I ever got involved with this site. Thanks for your long and informative post. I’m sorry to hear of your problem which must be very frustrating to you. Regarding the legitimacy of the site, I guess it really depends on if you are willing to do some of these ‘questionable’ tasks. In any case, really hope that you can resolve your issue and get your well deserved money. I have a similar problem, (payment sent to a wrong email address) I hope they will fix the error and pay me. You should try to send a support ticket to Microworkers to see if they can help you. Let me know how it goes. I have been blocked by Micro Workers for so called proxy. I emailed them but they failed to get back to me. I only just recieved my pin and entered it, later that day they blocked my account. So I went to whatsmyproxy.com to check if my IP was proxy but it wasn’t. This has to be a SCAM. I made $43 and as soon as I wanted to withdraw they blocked me. Sorry to hear about your experience with Microworkers turned out bad. Anyway I have heard similar stories such as yours as well with getting banned while using Microworkers Maybe you could have been using a proxy when you were completing your task accidentally. Such things can get picked up by the system and flagging your account for fraud and all, which could result to be a ban. Anyway, you should check this link. There are a lot of reviews that prove that Microworkers has been and still is legit. I was about to join job jungle, good thing i had a second thought of checking its legitimacy. Your review is such a good help. Can you recommend a legit site/s that i can join for an online typing job or any easy online account that i can do at home. I’m not sure about online typing or accounting job. It sounds like you want to do something more of a freelancer style, which I would recommend Fiverr to begin. I also recommend my #1 money making opportunity, Wealthy Affiliate, where I personally coach you one on one to make money online. Suppose I submit for payment to paypal account,how many days to get money through paypal. It depends I believe. If it is your first time, you probably have to wait a few weeks to receive the PIN. Picoworkers is another great site for small jobs. 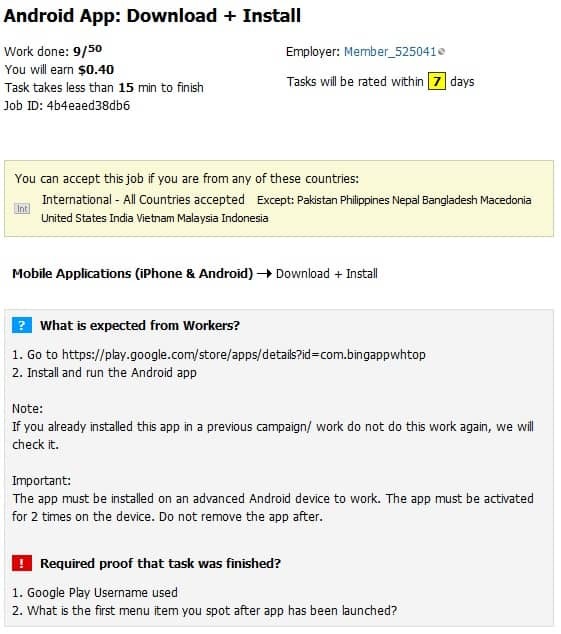 The tasks there include YouTube subscribe/comment, Facebook/Twitter likes, app downloads, signup up jobs, and much more. Almost all tasks are pretty easy to complete and there is lots of jobs available. They also pay for both new employer and worker referrals.